InstaNerd started as a side project by Alex and Natasha. After a lot of tries in the past years to create something that people will love to use, this happened to be the project to get the most attention. The idea was born with normal everyday talks between us, like -“Did you know why the sky is blue?” or -“Did you know that trees in forest tend to have the same height”. Then it hit us, why don’t we write all these interesting facts like cards on a website and display them random. Just like we say it one to another. The fact doesn’t need a post date or order, it needs to be interesting. People will love to read it when it’s short and makes them learn new thing. They will keep clicking the “Next” button for the next fact. So we got the final formula: instant + random + having fun + learning new things. People love smart things, especially if they are beautifully packaged. That’s how we came up with the fact card. The few lines you read got everything you need to know. You can read it while waiting the bus or when being bored. If you remember it, you can use it as a conversation starter, it can make you popular among your friends and colleagues or just improve your general knowledge. The first version of the website was build in a few days. The whole idea was for the website to be as simple as possible. We combined the facts with photos to be more memorable. We had approximately 100 facts written for start. We were not sure if it’s enough, so Natasha continued writing new facts every day and still does. Hey @ProductHunt I would be very happy if you check @InstaNerdMe Thanks, you are great. Immediately we started receiving feedback in the comments. People started helping us by suggesting new features and improvements, which we though that were ok, and we missed some things. All these comments were by people who have experience with launching products and were right to the point. It’s great when your first visitors are people that can help your build and shape the product. In the same day we made some of the improvements suggested. The most important thing is that they saw us on PH which is credible website and it was the best way to promote our project. Not to mention that it’s free, which is great for this kind of small projects without a budget. 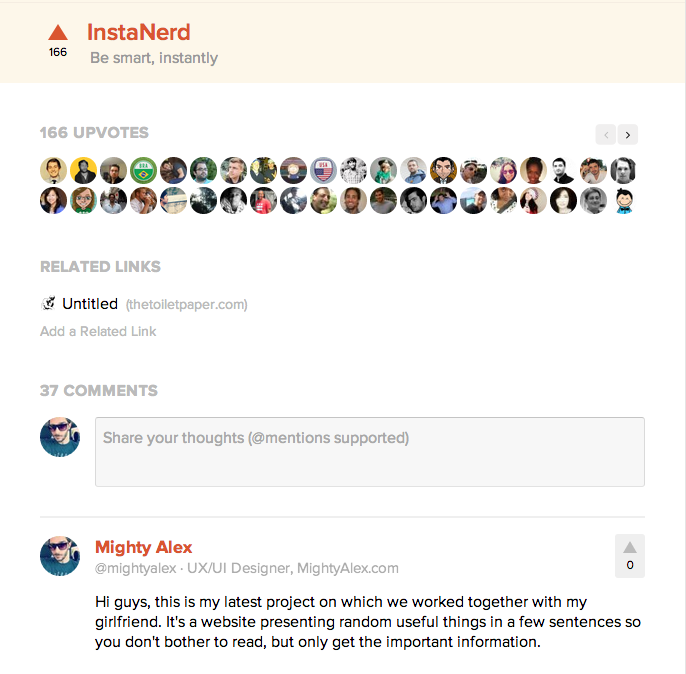 InstaNerd became one of the most popular projects that week, with 166 upvotes and 37 comments. The same day the website got 17,622 visits and 282,298 page views with 04:18 average session duration. That was more than we could ever expect. We started receiving emails from people that congratulate us. There were people offering help like app development or marketing solutions. It was the best kick-start for our small project. It gave us a motivation to continue working on it, improving the functionalities and writing new content on daily basis. - Ryan Hoover mentions InstaNerd on Product Hunt Radio: Episode 10. - Ryan Hoover mentions InstaNerd on This Week in Startups. Today it’s exactly two months after we started InstaNerd. We still have good traffic on the website and have around 750 e-mail subscribers. We started the newsletter two weeks after the peak in traffic from Product Hunt, so maybe we missed some of the potential subscribers. We are now back to our everyday freelance jobs, but keep working on it as much as we can. Natasha is writing content almost everyday and Alex keeps improving the design and the functionalities. We'll leave some details for the next post, for example the new features like the widget, the pop quiz, the iPhone app and the several obstacles we encountered so far.